Tooth sealants are a thin, highly-protective coating that aids in protecting the chewing surfaces of the teeth from being damaged by the development of tooth decay. According to the American Dental Association, one of the most common areas for the development of tooth decay is on the chewing surfaces located on the back side of the teeth. These areas have grooves which are called “fissures” and “pits”. These grooves help to grind up food that is consumed. While brushing and flossing help to remove food and other types of debris from the smooth surfaces of the teeth, the grooves are more difficult to clean. As a result of this fact, a pediatric dentist may recommend placing sealants over the chewing surfaces. Dental sealant is a very thin plastic-based coating that is bonded within the grooves of the teeth. Previously, these were referred to as “pit and fissure sealants”. Now, they are referred to, simply, as “dental sealants”. The sealant material is usually either clear or white in color. These have been utilized by dentists since the late 1960s. They are a necessary component to protecting the teeth from the development of tooth decay because the grooves of the teeth trap various types of debris that may harm the teeth. These include particles from food, plaque, and other substances. The more debris that becomes lodged in the grooves, the more of a chance that tooth decay will develop. According to statistics, 80% of all of the decay in the teeth that happens in children initiates and continues to develop within the pits and the fissures. While it is true that these areas only account for 15% of the surface of the tooth, decay has the ability to destroy 100% of the tooth. If sealants are placed on that 15% surface, the risk for developing cavities in that tooth is lowered almost 100%. 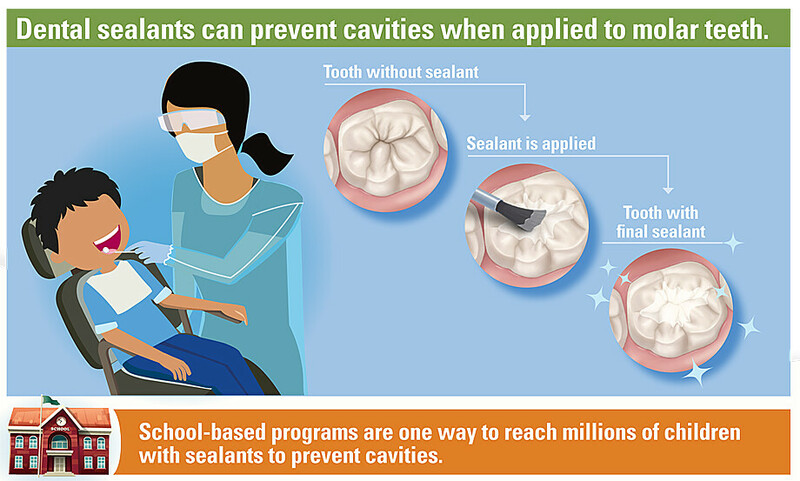 Unfortunately, only 43% of kids between the ages of 6-11 have dental sealants, but all children require them. Applying dental sealant to the teeth is an easy and completely painless process. It takes just a few minutes, but the benefits last for years. The first step is completely cleaning the teeth. Then, the teeth that are to receive the sealant are dried. Etching may be used on the teeth to roughen up the surface just a bit so that bonding is effective. Immediately thereafter, the teeth are rinsed and they are completely dried off. Sealant is then painted directly onto the enamel of the teeth. As time progresses, the sealant hardens. In some instances, a dental curing light may be used to aid in the hardening process. Dental sealants are effective for up for a decade; however, they must be checked to ensure no cracking or wearing has occurred. If you are ready for your child to receive dental sealants, you may contact us today to set up an appointment.